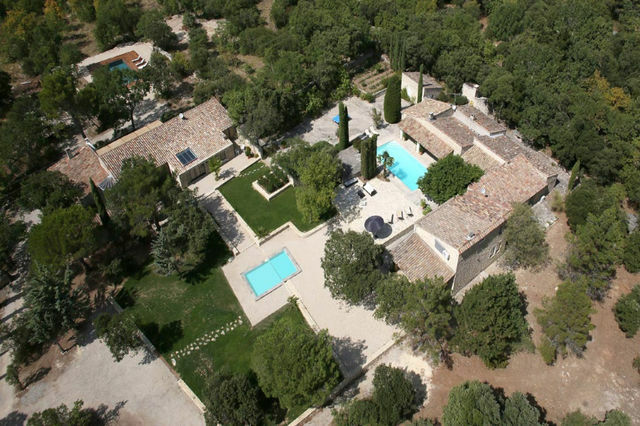 Gordes – Superb housing complex, about 420 m2 habitables, stone properties consisting of a main house, a guest house, a loft, a separate bedroom on a very beautiful wooded 1.5 acres with two pools and tennis courts, and an unobstructed view over the Luberon. SITUATION A few miles from the famous hilltop village of Gordes. A 15km from the A7 45km from the TGV at Avignon. A 45km from the international airport of Marseille – Provence. DESCRIPTION Stone property consisting of three independent houses: – Guest house 145 m2 Large living room Bedroom ensuite with shower room Bedroom Lounge/dining with fireplace Terrace with large pool (10 x 5) and electric cover Tennis courts – Separate bedroom with shower room and WC 17m2 – Main House 200 m2: Large living room Lounge Dining room Open plan kitchen Bedroom ensuite leading to a dressing and a bathroom Bedroom ensuite leading to a laundry and shower room Ensuite bedroom with a shower room and toilet Large terrace with swimming pool – The Loft 60 m2: Large room with an open kitchen Chamber upstairs (mezzanine) Shower room toilet COMFORT: Air conditioning, electric shutters, heat pump, oil fired central heating, all kitchens are fully fitted and equipped. COMMENTS: This property is unique, it offers many possibilities with its wide open spaces, in an idyllic setting. Ideal rental business or as a vast family home. Contact us for more details.